Plant tart cherries in full sun on well drained soil. In colder locations, planting on somewhat higher ground, if possible, can help avoid frost damage since tart cherries bloom early in the spring. Surefire blooms later than other tart cherries. Tart cherries are self fertile, so you can have fruit with just one tree. English Morello, Northstar, Surefire and Balaton are Morello type cherries. 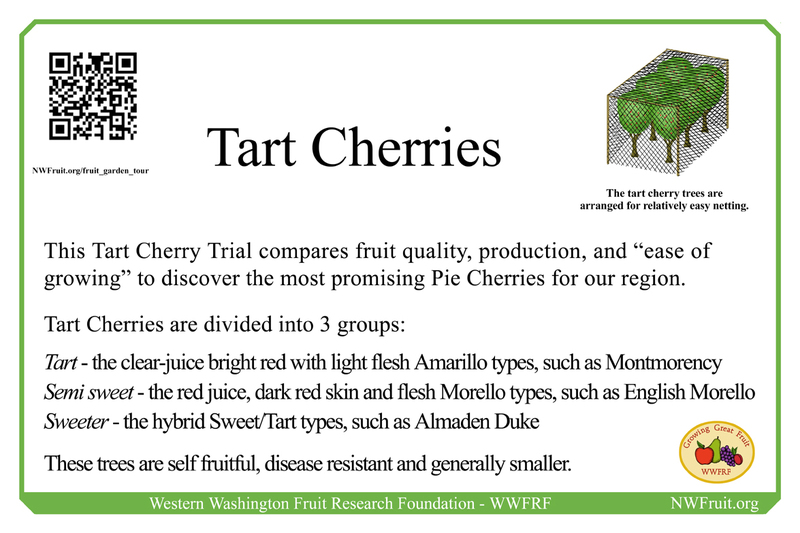 The Montmorency tart cherry is already established at the south end of the outer oval to the north of the Tart Cherries. In the spring of 2016 we planted English Morello, Montmorency, Surefire, Carmine Jewel, Almaden Duke, and Danube in the Tart Cherry block.